Nagarpanchami or Nag Panchami as it is commonly called is a festival celebrated exclusively for Snake Gods.In the Krishna temple near our house,there is a residing deity of Snake God and every year on this day many Poojas and Abhishekams are made to please the Naga devathas.Being literally a wall away from a temple,any festival was a reason to celebrate. The main offering was that of milk.The abhishekam was of tender coconut water.Hundreds of coconuts were readied-all the green part taken of,it used to be all white.Just a cut and it was ready to be poured for the abhishekam. Strange-when I searched for Trivia on Nagapanchami,instead of finding anything useful,I came across this link.Honestly,if we look down upon our own festivals,how can we expect others to respect it..? ?Beats me.Nithya of 4th Sense Samayal has a beautiful article on Naga Panchami.Click here to check it out!! It is a common belief that anything which requires the use of a sharp knife/spatula is to be avoided on this day-Eg-Dosa,Appey etc.Amma always made Adsara undi-Dumpling made of rice and coconut and it used to be served with Dali thoy.As with everything else,I disliked it while I was young and now that Nagar panchami is here,I can’t wait to make it!! Grind the grated coconut to a smooth paste in the mixer. Drain the soaked rice and grind it along with coconut to a coarse paste-almost the consistency of sooji/semolina. Add the jeera and salt to taste. 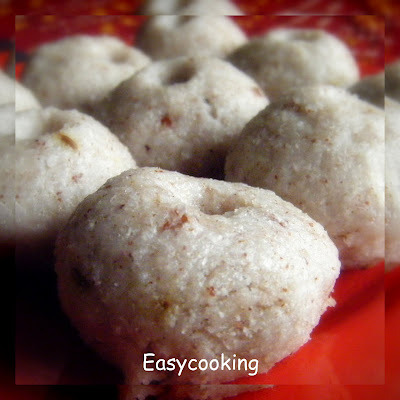 Make small balls out of the paste[size of a lime] and steam in a steamer or an idli cooker for about half an hour or till a toothpick inserted comes out clean-You could also cook the batter,as in Undi which would make the batter stiff and pliable.This way,it is easier to make into round balls and then steam them.Follow whichever method you are comfortable with. Serve hot with delicious Dali thoy. This is a lovely post about the festival too. :) Thanks for linking it to mine. And this dumpling is absolutely new to me.. we have not made this before. The next day after naaga panchami is celebrated as garuda panchami for us. Today we have made Goddess Gowri with turmeric powder and we serve kolukattai/Jillidikaya(sweet dumplings) as prasadam. Well explained Divya. Nice treat. oops......shud be "savoury treat"instead of sweet treat in my last comment..
Nice post divya, my mom makes these every year! What about the phanna in the undi? My mom puts phanna with mustard seeds and methi. Also we eat with humman or godda paanku. We make this for breakfast often...love it. Nice dumplings and good post. very similar to kozhukkattai no? Never had nor heard about it before...so it was really interesting to read through it :) And the Undi's look perfect! first time here and am so smitten by ur blog.so lovely. hoping to be coming back for more. Hello Divya....I am first timer here at ur blog...And believe me am hooked! :) More than ur recipes, ur ernakulum stories are so much so in sync with the ones my hubby keeps talking about :)...Pai's thattu kada, Porota-Beef fry, Palada, Temple tales etc....Just came back to show my hubby the site and take him down his memory lane :). I am a Mangalore Konk born n bred in Chennai, and hubby is a Kochi Konk, from Ekm.We are now in the US, so all your writeup about Ekm feels good to hear! Will keep coming back!! Thanks so much.